I was back at the amazing Warwick House today for Jack and Becky’s wedding. I was booked by them at the Open Evening last year. Today was a lovely and sunny day- Perfect weather for a wedding! They booked me me for my most popular package. Firstly this is mix and mingle after the ceremony. I go around the guests in the bar area or garden and get everyone in the mood. Then it is around the tables during the wedding breakfast. Finally it is some special bride and groom tricks at the Top table as seen in the photos. The photographs are screenshots of a video taken by a guest using my camera. This is something I do in order to make sure the reaction of the happy couple is captured. ” We booked Owen for our wedding at Warwick House in Southam. If I am perfectly honest, I am lost for words! Owen melted my brain with so many different tricks. All of the Children were stunned at what they were seeing. At some points I wasn’t even sure if what I was seeing was just a trick. I am pretty sure it was real magic. Thank you so much Owen, hope to see you again soon” As I am now a recommended supplier at Warwick House, I will hopefully be doing many more weddings here. One of my first weddings was here, so its somewhere I am very fond of. One of my business cards features a photo from this first wedding. I now have a small gift that goes in every goody bag that prospective brides and grooms get. I will also be at the open evenings that they hold a few times a year. 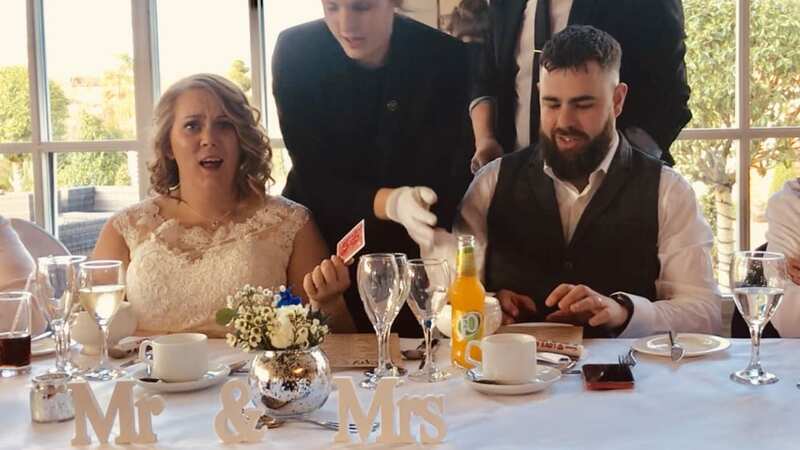 To have a look at the venue this is the websitehttps://www.warwickhouse.co.uk For more phots of me performing at weddings take a look at my gallery here.https://owenstrickland.co.uk/magician-gallery/ Please get in contact to discuss how I can make your day even better.